Broadband over Power Lines, or BPL, refers to the transmission (sending and receiving) of digital data through existing power cables and electricity distribution infrastructures. This can be viewed as a mere variation on using television cables; instead of using television cables, though, power transmission lines are going to be used. The key to broadband over power lines (Broadband over Power Lines) technology lies in a long established scientific fact: radio frequency (RF) energy can be bundled on the same line that carries electrical current. Since RF and electricity vibrate on different frequencies, there&apos;s not going to be any interference between the two. As such, data packets transmitted over RF frequencies are not overwhelmed or lost because of electrical current. The Broadband over Power Lines system does not utilize the complete power grid. Electricity from power generating plants proceeds to transmission substations which distribute the current using high-voltage transmission lines carrying between 155,000 to 765,000 volts. These high-voltage lines are not suitable for data or RF transmission. The Broadband over Power Lines solution is to bypass the substations and high-voltage wires and focus on the medium-voltage transmission lines (carrying around 7,200 volts) and the transformers that convert the electrical current to 240 volts – the electrical current used in households. In other words, standard fiber optic lines specifically designed for Internet transmissions are going to be used to carry data. These fiber optic lines will be connected to medium-voltage lines. Repeaters are installed at these junction points to &apos;repeat&apos; the data and boost the strength of the transmission. Couplers or specialized devices are also going to be installed at the transformers to provide a data link around these. 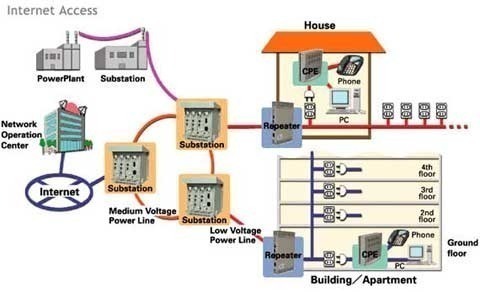 After that, the digital data will be carried down the 240-volt line that connects to the residential or office buildings&apos; electrical outlets which become the final distribution point for the data. At this point, the residents and the office administrators have two options for Internet connectivity. They can get wireless transmitters that will wirelessly receive the signal and send the data on to computer stations or they can get Broadband over Power Lines modems for data filtering -the Broadband over Power Lines modem will screen out power line noise and let only data through – then send the data onwards to the stations. The wireless transmitter or the Broadband over Power Lines modem can transmit the signal to end-users or computer stations wirelessly (which necessitate WLAN-capable devices) or through wires (which require computers connected to the data transmitter or Broadband over Power Lines modem through Ethernet cables). Although the technology for Broadband over Power Lines is available, and companies have started offering the service in the US, it is facing opposition from ham operators and the Federal Emergency Management Administration (FEMA) who are concerned that Broadband over Power Lines technology will reduce the number of radio frequencies available for ham and short-wave radio operators and that RF transmission over unshielded medium-voltage lines will cause interference with already-assigned frequencies. There are also no set transmission standards for Broadband over Power Lines technology. This is further hampering efforts to have the technology adapted by more Internet Service Providers. Hi i am April, also from Philippines, is it possible for Cable TV company to apply broadband over powerline as the backbone for internet service from ISP? Let say, instead of using their existing cables for rf signal transmission, they prefer to use the existing electrical wiring. How do they operate internet access from ISP to provide service to people and at the same time to continue servicing people for television-viewing purposes? I’m no expert on this, but what you’re describing doesn’t seem to be broadband over power lines if you intend to just transmit over TV and radio waves. You might want to look into WiMax or cable TV. agree. It must be an IPTV in order to be served thru broadband using power lines. This is the next generation technology – one generic connection for TV/audio, smart home or home networking, security camera, alarm systems, meter reading(electricity, water or gas), energy usage management, telephone, high speed internet/wi-fi provisioning and extension and all other IP-based applications. 254 queries in 0.490 seconds.